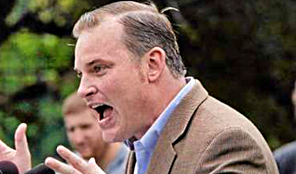 NOM's Brian Brown: The Duggars Are Under Attack By The Gays! Send US Your Money! Home/Featured/NOM’s Brian Brown: The Duggars Are Under Attack By The Gays! Send US Your Money! As you may have already heard, the Duggar family – stars of the hit TV Show 19 Kids and Counting – have come under attack from bullying activists and radicals simply because of the Duggars’ strong pro-family witness both on and off their show. I ask you to take a moment today to join me in showing your support for the Duggars. We need to send a message to let them know that we, the advocates of traditional marriage and family, appreciate their strong moral voice in the public square. They are an example of how strong marriages and families lie at the foundation of a healthy society. We need more celebrities like them, not fewer! Our country needs a healthier public square where people are heard respectfully, and not merely shouted down by those who disagree. This moment that the Duggars are facing is a test case for what kind of society we want: one where the values of tolerance and respect are truly practiced, or one where only those on the politically-correct side of the conversation get to be heard.” – National Organization for Marriage hate group leader Brian Brownshirt hitching his money beg wagon to the backlash against TLC’s Duggar Klan. Anything for a buck, eh Brian? Open the Champers and Pass the Nibbly Bits! Patsy and Edina Return For The ABFAB Olympics Special on BBC!